So, I got my first new catalog order in last week and just haven't had much time to play with it. But I did sit down to play with two of my new Big Shot items. I bought several new Big Shot items but I was most excited about these two things. 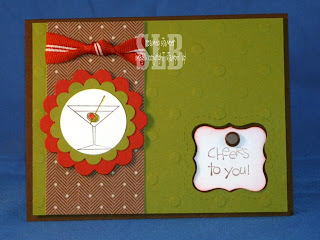 The exclusive Stampin' Up Texture plates, and the Movers & Shakers Curly Label die. I used an older set but one I personally haven't used before so most everything on this card is "new" to me! I hope you can see the texture on the Old Olive cardstock back. It's really cool in person and gives so much added dimension to the card. I can't wait to have some time this weekend to play with my other new things! Look at you playing with all that new stuff. Is the brown strip on the side the new paper? It almost looks like ribbon. Can't wait to order mine! Rhonda, that's the new To The Nines Specialty DSP. It's just lovely and textured!